Industrial parts cleaning “x-tra large”. Not only fine cleaning tasks occur in industry, service and reconditioning cleaning, but the workpieces to be cleaned are often large, heavy and soiled with polishing pastes or oils. The Elmasonic XL machines in 3 sizes (140 to 300 litres usable volume) with overflow pocket and optional skimming equipment and product carriers are suitable here for cleaning heavy and large parts. The optional heavy-duty oscillation is installed inside the equipment so that the noise insulation folding cover can be closed during operation. Particularly cavitation-resistant oscillation tanks promise a long service life. All machines are equipped with ultrasound from the bottom, ultrasound on 2 or 3 sides and the ultrasound power can be manually set from 10% to 100%. 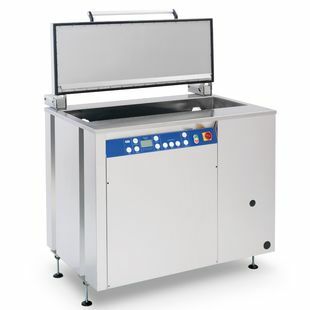 Other functions such as Pulse, Sweep and Degas increase the ultrasound performance, provide better sound distribution or degassing the cleaning bath for new preparation.